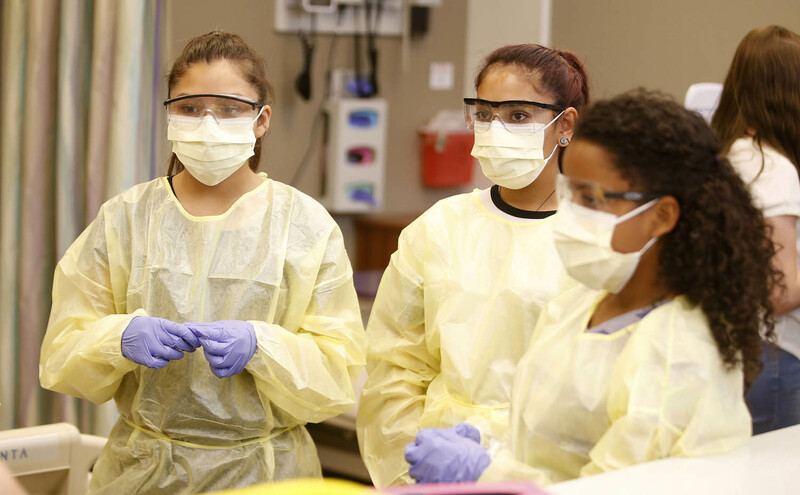 Students got to dress in gloves and scrubs for their up-close-and-personal look at what a nursing career is like. Wearing scrubs and surgical gloves and with a stethoscope around his neck, ninth-grader Daniel Apodaca listened to the “patient’s” lungs. Was her breathing normal, or did he detect a wheeze that is typical of pediatric asthma? Was there fluid that indicates pneumonia? 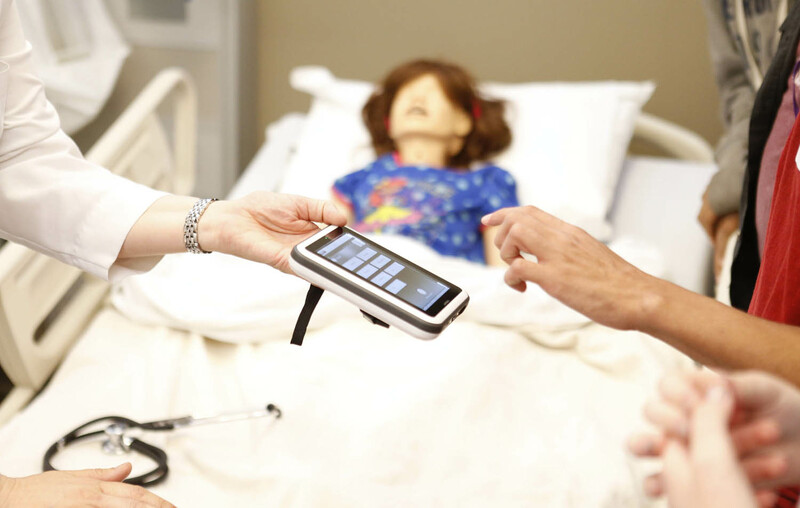 Not only can the simulated child rasp and wheeze, she can also vomit and scream, said Crystal Bowman, lab simulation manager and professor in Grand Canyon University’s College of Nursing and Health Care Professions. 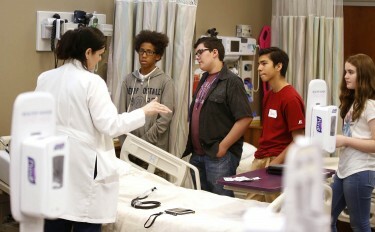 Students from Osborn Middle School listen to instructions from a GCU mentor. And the fact that Apodaca and his 30 or so colleagues from Osborn Middle School were allowed to evaluate her is one of the unusual perks of GCU’s programs, which don’t limit advanced training to experienced students. Apadoca, who will enter Camelback High School this fall, and the others toured the labs and the campus as part of a career camp they are attending. They were riveted by talks from GCU nursing faculty, all of whom left nursing careers to become nursing teachers. Nurses aren’t just limited to hospitals but can work nearly anywhere, from a cruise ship to a mission and from a hospital to a summer camp. “There are so many things you can do,” said lab simulation faculty member Susan Newton, a former intensive care unit nurse. Ashley Kinder, who runs the labor and delivery simulation labs after years as a labor and delivery nurse, piqued the interest of Apadoca and the other male students when she said that increasingly, men are joining the nursing ranks. A simulated patient was used to teach students. “This is a wonderful experience for them to be exposed to this at a pivotal time in their lives, when they are giving careers some thought,” said Kathryn Scott, GCU’s director of Strategic Educational Alliances. His bowels make noise, his pupils dilate and he has a pulse, among other bodily functions, Quillman said. Apadoca wasn’t necessarily thinking of becoming a nurse until Tuesday’s trip, but he was impressed with the cutting-edge technology in the nursing college. “Now that I got see the sim lab it’s really cool because you have a more vivid idea of what taking care of a patient is really like,” he said. Eighth-grader Romitzy Cordova made up her mind Tuesday that she wants a career in health care. Here’s a slideshow of the event.